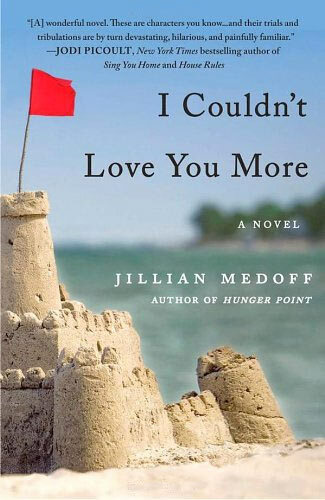 Jillian Medoff is the author of the new novel This Could Hurt. Her other books include I Couldn't Love You More and Hunger Point. 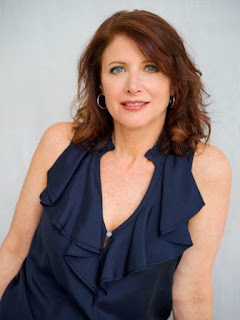 She has worked as a management consultant for many years, and is a senior consultant at the Segal Group. 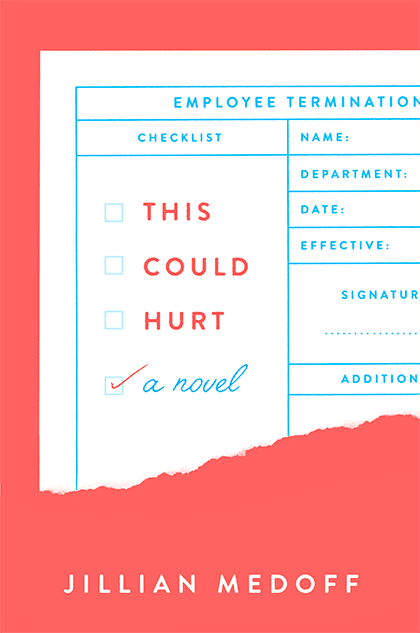 Q: You note that This Could Hurt was inspired by your interactions with a former boss who had suffered a stroke. How did that experience lead you to create the world you depict in the novel? A: I have a long-time career as a management consultant. I advise HR executives on how to communicate with employees during organizational changes that range from big high-stress events (i.e., mergers & acquisitions) to smaller but equally complicated benefit modifications (i.e., implementing a 401(k) plan). I've worked for several Fortune 500 companies (Deloitte, Aon, Segal), so I had a comprehensive understanding of HR but mostly from the outside looking in. In 2009, I was laid off from Aon after 10 years and took a job in the HR department of a research company. My boss, a woman in her 60s, was a bully who lied, yelled, and tormented her staff; she also appeared to be losing her faculties. She told me she'd had a stroke a few years before, and I wondered if this accounted for her erratic behavior. She had a small staff of senior managers—much like in This Could Hurt. They'd worked with her for many years, and were very loyal, despite fearing her wrath. (The company had gone several rounds of layoffs, so they probably thought that by saving her, they’d also save themselves. Unfortunately, business doesn’t always work that way.) They covered for her in meetings and behind the scenes in ways that surprised me. I eventually left the company (it's impossible to work for a monster, no matter how much you may sympathize) but her story—-and her staff’s—haunted me. In 2010, I was back in consulting but now I was older and suddenly aware of my age. Corporate life is hard on aging women, and I kept thinking about my former boss. I had so many questions, which is how I usually approach a new novel: it’s a way to get answers to all my unanswerable questions. The fact is I knew very little about her personal life—or the personal lives of my colleagues—despite having worked together all day, all week for a year. This interested me too; how we spend so many hours with coworkers and yet there's so much we don't know about them; rather, we know what they want us to know. I’d always wanted to write about corporate life, and my former boss’s stroke offered a way in. Q: You tell the story from a variety of characters' perspectives. Did you write the book in the order in which it appears, or move things around as you worked? A: As a writer—as a thinker—I’m very methodical and very organized. (In retrospect I should’ve been a police detective.) When I start a novel, I usually have no idea where it’s going. 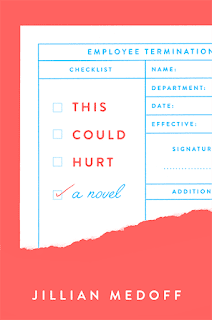 I mean, I knew This Could Hurt was about one woman’s imagined on-the-job stroke and her staff, but that’s about it. I write the way I like to read, which means it takes me a lot longer to tell a story because my first two years are spent getting to know the characters. Originally the book was about Rosa—the aging executive—and Rob—a middle-aged middle-manager who was burned out. But then I expanded the story to include their coworkers’ points of view and threaded the sub-plots. In this way, you see one character’s limited understanding of a particular situation, which is very true of office life—you rarely know everything that’s going on when changes are being made. By the end of the story, plot twists and backstory is revealed, which gives the reader a far more comprehensive view than any of the individual characters. Ultimately, I thought of the novel’s architecture as a sundial. It opened in the morning, closed in the evening, and along the way, we’d see characters 1 (ROB), 2 (LUCY), 3 (ROSA), 4 (LEO), 5 (KENNY) and then 5 (KENNY), 4 (LEO), 3 (ROSA), 2 (LUCY) and 1 (ROB). The later chapters are mirrors of the earlier chapters. Of course, life doesn’t always work out the way I want (and neither do 400-page novels), so to tell the story correctly, I had to add a Rosa chapter at the beginning and a Rob and Rosa chapter in the middle. It’s not perfect sundial but it’s very close; rather, as close as I could get to perfect. A: There is a lot of double-speak in business. People will say something and then add qualifiers, explanations, caveats, etc., almost to the point of contradicting themselves. (This is why I included Lucy’s footnotes (see question 4 below)). But Rosa has always been a straight shooter, particularly as a boss, so her saying “Brace yourself, this could hurt” is a way to prepare her staff for bad news. I also liked it as a description of the book; it’s a very funny book but inside the humor there’s an equal amount of pain. Isn’t that like life? Q: The book, set in an HR department, includes various organizational charts. How did you come up with the idea of including them, and what do they say about the characters? A: As I started the book I thought about sweeping sagas that include family trees at the beginning as a ways to help the reader see the generations, lineage, who married who, etc. I knew this novel was about the intersection of work and family (and how, as colleagues, we are a kind of family), so I thought the org charts were a cool way to show the relationships among the characters. But then I decided to use them throughout the book, and they became even more than a tool for keeping track of who’s who; they also offered a visual representation of the changing department. It’s pretty powerful to see the constant changes in one image, and it’s also a fair depiction of what happens to a dynamic business in a tough economic market. Some departments become revolving doors for employees—in, out, in out. I’ve always used non-traditional content in my novels. My first novel, Hunger Point, had resumes, faxes, emails, checklists, as did both my other two. In This Could Hurt, I also added footnotes, which, as I said above, are a way to reflect corporate double-speak. I only wanted these footnotes in the Lucy chapters because they’re very illustrative of her personality but they’re also a signal of what it’s like to work on long, long, long compliance documents where the footnotes are as lengthy and as complicated as the actual content! A: An updated, refreshed Bonfire of the Vanities for 2018, although by the time I finish it will likely be 2028. A: I’m very proud of This Could Hurt. I honestly didn’t think I could pull it off so the critical reception has been staggering and well beyond my expectations. Of course now I’m staring at a blank page so once again I’m at the bottom, hoping to kick my way up to the surface. Purchase This Could Hurt here.